Bulls Gap School: Highlights - Dirt Pies! Our first unit was all about camping, and one of the camp snacks was dirt pie. We learned a lot while we made dirt pie! 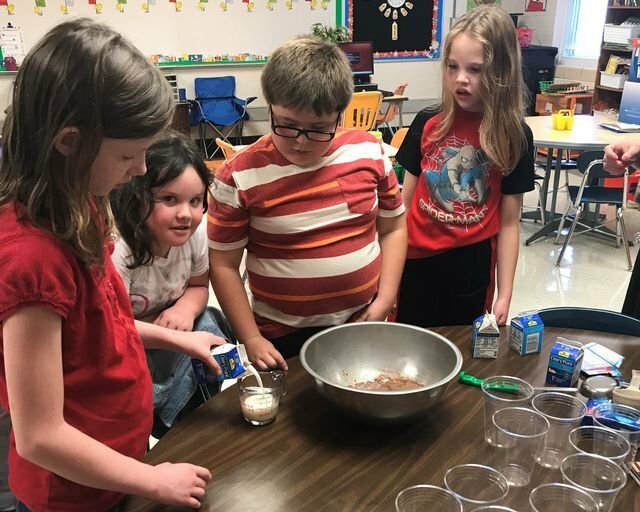 *We counted quarters to buy milk from the cafeteria to use in our recipe. *We talked about food safety and how and why to store milk properly. *We learned proper hand-washing techniques and how to keep our hands clean while cooking. *We also learned to keep our hair back and away from the food. *We measured milk and poured very carefully. *We discussed addition and even multiplication as repeated addition when we counted *Oreos and gummy worms to add to our desserts. *Everyone took turns pouring and stirring, and each child got to add the "dirt and worms" to two cups. Making dirt pie was a delicious learning adventure!